Towards the tail end of the Eighties, a new phenomenon in books came along – the Where’s Wally? (or if you come from the US – Where’s Waldo?) series. These books had incredibly detailed and intricate drawings depicting various different types of scenes in which the stripy jumpered Wally was hiding, and it was the readers job to scour the pages trying to find him. 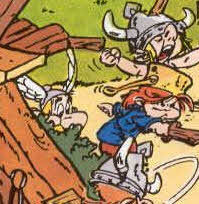 The concept proved very popular and as well as several follow up Wally books, it has also been applied to other famous characters, and one of these is Asterix the Gaul, in a book entitled, funnily enough, Where’s Asterix? Where’s Asterix contains 12 action packed double page scenes in which it is your task to locate the famous French character. To add to the fun each scene also lists a number of other things for you to try and find, turning the book into a game in the process. You award yourself one laurel wreath for everything you find, and two every time you locate Asterix himself. If you manage to attain between 50 and 65 wreaths you can declare yourself a champion Asterix spotter! It’s a good fun book, and whilst I enjoyed it knowing a little about Asterix, my three year old daughter also found it highly amusing too, especially liking the page where a number of knocked out Roman centurions are lying on the roofs of some houses. If I have one complaint though, it’s that some of the things you are asked to find are made rather difficult due to them being positioned right in the middle of the page join, but otherwise it’s a very nice book, and is very reasonably priced at Â£8.99 for a slightly bigger than A4 sized hardback. This entry is filed under Books and Magazines, Reviews	and was posted on September 9th, 2011. You can follow any responses to this entry through the RSS 2.0 feed. You can leave a response, or trackback from your own site.